(Palgrave Macmillan, 2016) xiii + 371 pp. Reviewed by Julia Hansen on 2017-09-02. During a visit to Wellesley College in October 1875, Henry Wadsworth Longfellow took a boat ride that he describes as follows: "After dinner a row on the lake in the College boat 'Evangeline,' with a crew of eight girls, and the handsome Captain, Miss Emerson. It was like sailing with the nine muses" (qtd. in The Letters of Henry Wadsworth Longfellow, ed. Andrew Hillen, 6: 74n1). Within Longfellow's epic poem Evangeline, boats not only play a crucial role in the Acadians' exile but also feature prominently in one of the poem's most famous scenes, the scene in which Gabriel and Evangeline just miss each other, their two boats separated by Louisiana palmettos and willows. Clearly someone at Wellesley named the College boat after the poem, in effect making the boat part of Longfellow's reception. Just as clearly, Longfellow does not explicitly connect the students to his poem, but to a flattering, classical mythology. To what effect? Our potential critical objects are known--Longfellow, Evangeline, the "Evangeline," Wellesley, Wellesley students, the nine muses--but the syntax establishing the best line of critical inquiry is not. Considering this anecdote as an instance of "author love" requires such a syntax: who loves whom, or what? How do you know? And is our aim to understand this love, or to use this love to understand something else? Recent scholarship in nineteenth-century studies has taken a keen interest in how, why, and when historical readers engaged with particular literary texts, characters, and authors. This interest has ranged from tracking the influence of copyright law, print formats, and circulation on authors and notions of authorship (Andrew Piper; Meredith L. McGill) to investigating how books were used whether or not they were read (Leah Price). Other studies have highlighted the afterlives and remediations of texts, considering a text's "procreativity"(Ann Rigney, one of this collection's key influences), historical poetics (Virginia Jackson; Yopie Prins), the political and cultural use of quotations and appropriations (Daniel Hack), and the rise of literary tourism (Paul Westover; Alison Booth). Most significant for this volume, given its title, is the conversation led by Helen Deutsch, Adela Pinch, and Deidre Lynch concerning the role of love--transatlantic, historical, transhistorical, haunted, habitual, professional, libidinal, queer--in readers' relationships to literature and literary studies. Given that author love, literary tourism, and transatlantic studies all explore ideals of presence within here/there relationships, editors Paul Westover and Ann Wierda Rowland have rightly sensed that the time is ripe for these critical conversations to connect. According to the editors, this collection explores nineteenth-century readers, their reading, and the invention of "English" as a transnational identity. "What came to be called and canonized as English Literature in the twentieth century," the introduction claims, "was largely a nineteenth-century Anglo-American invention, the product of a wide range of inscriptional and material practices animated by the affective, social, and identificatory experiences of readers" (3). Westover and Rowland care as much about how "English" became a transnational identity as about how "English literature" was produced transatlantically. To understand transatlantic English literature and transnational Englishness, they argue, we must study what Nicola J. Weston calls the "wider cultural history of reading" (qtd. 6). In particular, building on Rigney's work, they advocate studying readers' attachments to authors and the material forms these attachments took. By focusing on the authors and texts that nineteenth-century readers read as well as their "supra-textual" forms of response, the editors promise to recover a kinder, less agonistic model of transatlantic, literary-critical, and author-reader relations. Further, they hope to "suggest something" about the influence of literature on "mentalities" and "social and political conditions" (7). Though the essays are ordered chronologically and only secondarily by content or theme, the editors describe them in three groups. The first group explores the uses of transnational texts and authors for national and transnational aims; the second examines literary geographies and tourism; and the third looks closely at readers' material culture, visual culture, and intellectual, affective, and social engagements with favorite authors, characters, and texts. An especially instructive essay is Scott Hess's analysis of two "landscapes of genius," two natural landscapes associated with specific authors: Wordsworth's Lake District and Thoreau's Walden Pond. While at first the authors themselves seem to be what readers seek within the landscape, Hess perceptively shows how the author figure morphs into a medium through which literary pilgrims feel they have experienced the natural world. The physical environment promises to link them to the author, yet the author ultimately connects them with "nature." Here, "author love" is said to depend not only on readers' familiarity with an author's work, but also "on a drive to identify personally with that author" (185). Hess might have considered whether readers' identification with a person transfers to an identification or simply a connection with a place, and he could have further examined how Wordsworth-love and Thoreau-love might influence each other over time. Nevertheless, his argument benefits from the clarity with which he defines "author love" and the role it plays as an under-studied influence on "nature writing" and on environmental projects such as the national parks. Not all contributors share Hess's definition of "author love," of course, and this is as it should be. The editors instead treat "author love" as an "umbrella term" (13), a term that covers acts of identification, pilgrimage, creating public memorials, writing biographies, sustaining critical conversations, and reconstructing the author's physical person, as well as measures of popularity such as book sales and recognizable quotes. Joseph Rezek's fine, carefully-researched essay on James Fenimore Cooper's contributions to a British Standard Novels series shows, for example, how a collected edition not only turned Cooper into a "heroic figure" (57). It also turned Cooper into a reader of Cooper, as he revised his novels to meet the aesthetic criteria of his British publisher and readership. Rezek shows that Cooper's actual and anticipated receptions end up shaping Cooper's revisions, which in turn affect which versions of Cooper we read, teach, and write about. This is a fascinating angle on "author love": Cooper's desire to please his readers shifts his own authorial practice and persona. Author love leads to a desire for reader love, which in turn remakes the author. This line of argument differs as much from Hess's as it does from, say, Rowland's rapt account of Louis A. Holman's Keatsiana, in which (Rowland asserts) an individual reader's passionate attachment to Keats shaped and could reshape our discipline's methods for valuing and evaluating non-professional, rigorous epistemologies of love. These three essays also mobilize "transatlantic" in different ways. Hess takes a straightforward comparative approach with only a brief consideration of Thoreau's awareness of Wordsworth's Lake District. In Rezek's account, by contrast, the relationship is more symbiotic: Cooper's British publisher needs Cooper even as Cooper refashions himself for British readers as a disinterested yet personally knowledgeable provincial writer. And in Rowland's account of Holman, the national identity of the man who collects and creates Keatsiana matters less than that man's class identity and contributions to Anglo-American Keats scholarship. Seeing these different author loves and transatlantic relations alongside each other enables productive comparisons of the volume's key terms. However, I believe the volume would have been stronger if more of the individual contributors had explicitly defined "author love" and reflected on how they recognize evidence of it, and also if the introduction had mapped the different definitions, evidentiary standards, and stakes that its readers will find throughout. The first four essays (including Rezek's) examine dynamic interplays between nineteenth-century literary nationalism and concepts of English literature as transnational. Delineating the varied discourses, genres, and national literatures deployed within Sarah Josepha Hale's popular Flora's Interpreter, or the American Book of Flowers and Sentiments (1832), Kelli Towers Jasper rightly shows that Hale relied openly on British poetry, using Britain's cultural past to show readers how they might cultivate American identities. Sharon Estes takes up the inverted yet reciprocal nineteenth-century claims that Longfellow is the "American Tennyson," and Tennyson the "American Longfellow." By means of these epithets, Estes argues that nineteenth-century readers help us understand the reprint market in more collaborative terms. Closing this first set of essays, which most directly supports the editors' claim that nineteenth-century readers explored Englishness as a transnational identity, Ryan Stuart Lowe considers the publication history and reception of Henry James's Hawthorne in the British series "English Men of Letters." By focusing on U.S. critics' response to Hawthorne, Lowe illuminates competing conceptions of "cosmopolitanism" as both the enemy of literary nationalism and its possible future. The second cluster of essays revisits literary tourism. Alongside Hess's landscapes of genius, we find essays on imagined and actual tours. Together this group leads us more firmly to readers' supra-textual forms of response. Exploring a fascinating idea of tourism "both inside and out," Charles Baraw argues that touristic culture facilitated Hawthorne's success as an author while also shaping the authorial persona and reading mode he promoted (133). Hawthorne uses touristic modes in his prose, Baraw shows, at the same time that he cultivates an author-reader relationship in which the author and reader go in search of each other (142-143). Motivated by a desire to understand "topo-biography," Booth examines and experiments with the research methods of two late nineteenth-century American women who wrote about literary lives lived in specific places. In recovering these methods, Booth investigates how biography might complicate our own interpretive habits. Likewise, Westover reads authors' homes as intentional forms of affiliation, studying architectural and domestic allusions to literary works and writers as one way in which authors positioned themselves within an emerging transatlantic canon. The third part of this volume considers more idiosyncratic examples of author love, examples that raise core questions about methodology. Nicely threading the impact of national authors on transnational communities (cluster one) with the role of material culture (cluster two), Christopher Whatley historicizes permanent memorials to Robert Burns in the U.S., Canada, and Great Britain, showing how the "Poet of the Scotch" could be adopted by and adapted for transnational communities. These essays also usher us (via the Burns suppers) towards more extravagant forms of "author love." Rowland's and Charles Rzepka's chapters conclude the volume on especially strong notes. Rowland investigates a striking example of author love, introducing Holman and his "illustrated" collection of Keats. Holman, as neither a professional scholar nor a pejoratively "amateur" Keats-lover, and his archive raise questions about how we as scholars value and create knowledge with more eclectic, affect-driven forms of knowledge-making. If Rowland pursued her thought experiment that she is reading "Holmaniana" rather than "Keatsiana" (285), it would be interesting to learn how Holmaniana might change our readings of Keats, as well as whether it needs to. Finally, Rzepka disrupts the focus on "author love" by investigating an instance of "character love": in the Baker Street Irregulars' devotion to Sherlock Holmes, Rzepka argues, Holmes and John Watson displace Arthur Conan Doyle as the object of readers' affections. For Rzepka, the BSI not only remind us that loving an author is like loving a fictional character. Through "The Grand Game," their codified hermeneutic, they also remind us of the "ludic ... delight" built into our discipline (294). Assuming as it does that "'literature' does not confine itself to books" (3), this volume admirably highlights wide-ranging archives and critical methods. In addition to the 500+ pieces of paper in the Holman Keats collection, the social/professional society of the BSI, and the painstaking attention to Cooper's revisions and the Standard Novel series, we find architecture, dressing gowns, and public statues. We also find far fewer readings of authors' (canonical or otherwise) literary writings. Given that fact, it would be helpful to know more about how the study of material culture, affective attachments, and social uses of literature can significantly shift or transform our understandings of an author, reading practice, literary text, time period, or culture. But, as with the variety of "author loves" and "transatlantics" on display, the assortment of evidence and method is itself generative. The volume's diversity of archives accompanies a startling lack of attention to difference and diversity among readers and authors (beyond "British" or "American"). The introduction highlights "transnational 'English'" as an ethnicity, and acknowledges that "English" in the nineteenth-century could carry "national, linguistic, ethnic, and racial connotations" (3). Yet many of the chapters speak of "readers" as a disaggregated group. And, as the editors acknowledge, even within a privileged transatlantic framework, none of the chapters consider Native American, African American, Asian American, or Caribbean authors or readers (10). Rezek, Booth, Rowland, and Rzepka reference their subjects' Eurocentrism, Saxon-imperialism, class, and gender, respectively. And Whatley distinguishes among not only Scottish, U.S., and Canadian attachments to Burns, but also between different Scottish political parties' attachments (250-253). These are welcome attentions that enrich these chapters. While still claiming to discover kinder models of transnational relations and literary critical stances, the editors and authors could give more attention to degrees of "kindness" as well as those to whom this expansive conception of "English" excludes. Estes's tantalizing quote from Longfellow's most recent biographer that, in the 1880s, there was a "desire--not unrelated to the racial politics of the Empire--to seek ways of affirming the transatlantic tie" (qtd. 93), shows just how much more work needs to be done in identifying and analyzing why particular readers or groups became attached to particular authors and conceptions of "Englishness" at particular times. Attending to the whys and hows of specific attachments returns us to the editors' double use of "love": as both critical object ("author love") and as suggested critical reading method. Using that which one studies as a way to reflect on one's methods of study is a compelling critical move, one that Booth and Rowland explore most extensively here. The volume's interest, therefore, in using studies of author love as a "corrective to our sometimes loveless academic and social climates" (14) is worthy of additional development. Although the editors acknowledge that love can be "possessive, divisive, and competitive," they ultimately hope that studying author love "may show us different, more positive ways to construct communities" (14). It will be up to future iterations of these projects as well as to future projects to provide more evidence for how author love might initiate or contribute to such changes. 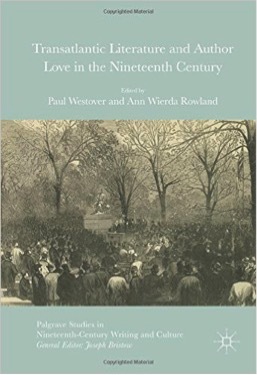 A first step towards providing such evidence might be to work through some of the key questions that this book provokes concerning nineteenth-century transatlantic "author love" itself. Are all forms of "reading" and "reception" forms of "author love"? How ought we to understand the habits, actions, and attachments of groups in relation to the habits, actions, and attachments of individual readers? When and for whom does "transatlantic literature" stand in for "transnational 'English'," and when are they distinct? Readers will find much to admire in these individual authors' contributions. As for the volume as a whole, it astutely assembles key terms and critical conversations in need of further analysis in relation to each other. It is time now for a sharper syntax concerning what nineteenth-century transatlantic literature, author love, and literary studies might make each other do. Julia Hansen is a Frederick Donald Sober Postdoctoral Research Fellow at the University of Michigan. Leave a comment on Julia Hansen's review.